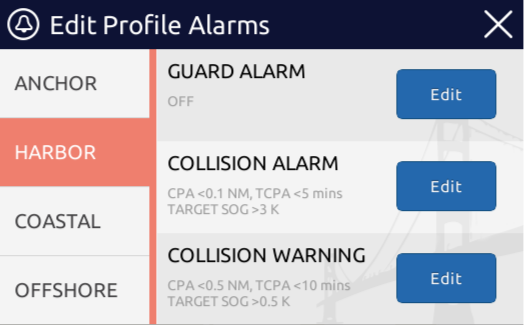 Each Alarm Profile has three settings associated with it. Select Profile Alarms form the Alarms Menu to adjust these settings. Guard Alarm is used to set a range around your vessel. Whenever a target penetrates your range setting, an alarm is triggered. 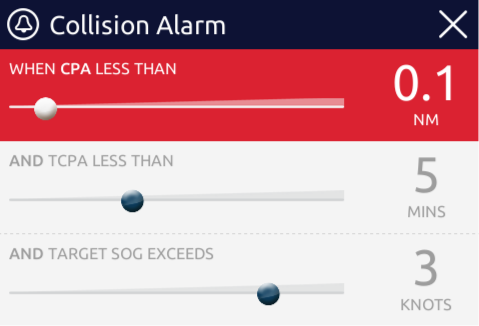 Collision Alarm is triggered when a target meets your alarm criteria. Collision Warning causes a target to be displayed in a warning state when it meets this criteria. On the left side of the dialog are the four profiles. Touch a profile to change the three settings associated with each profile. When adjusting the alarm and warning settings there are three controls which work together to determine the criteria. For a target to meet the alarm or warning criteria it must meet each of the settings. CPA is the closest point of approach. It is the distance that the target will come to your vessel if both continue on their same course and speed. If you want an alarm for any target that will come within a half mile of you at some point in the future, then set this value to 0.5nm. TCPA is the time of CPA. It is the number of minutes before the target will reach its closest point to your vessel. Use this setting to suppress alarms unless the CPA will be soon. For example, if you set this to 10 minutes it means that you will get an alarm when a target is going to come closer than your specified CPA within the next 10 minutes.